Monkey bread is so easy to make, which makes this Savory Breakfast Monkey Bread perfect for any brunch or breakfast! 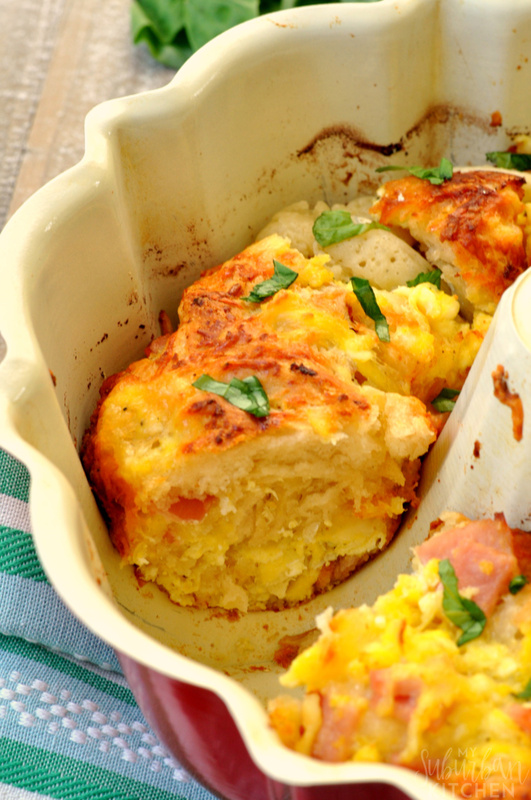 Homestyle biscuits, eggs, bacon, and swiss cheese, what could be a better combination for this easy monkey bread recipe? Make it ahead and enjoy it all week! Weekend brunch is something everyone loves! 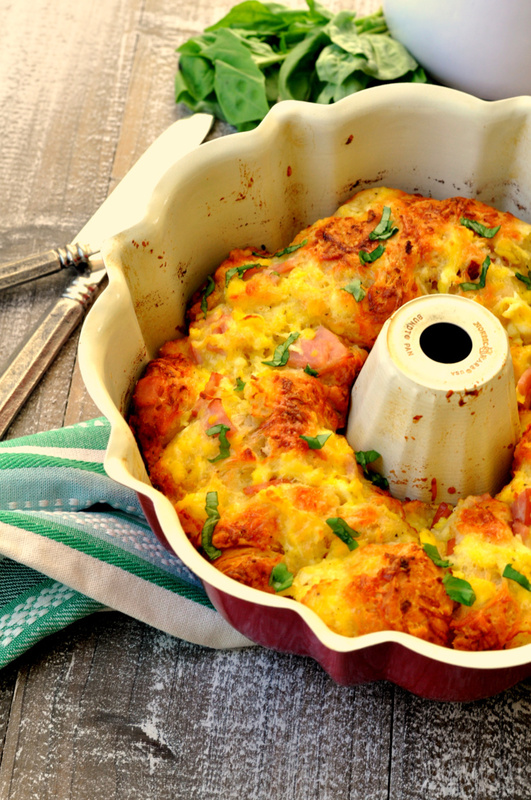 From special occasions like Mother’s Day to just regular Sundays, your brunch will be out of this world when you make this breakfast monkey bread. What is monkey bread? Typically it is a bread made of up of many smaller pieces of yeast dough (or in a lot recipes, biscuit pieces) and then topping with a sweet or savory sauce. Most people associate monkey bread with a sweet recipe. I adore the caramel or sticky bun versions but I definitely prefer more savory foods at brunch so I had to create a savory monkey bread recipe. When I was testing this recipe, I actually saved the rest of it and ate throughout the week for breakfast. 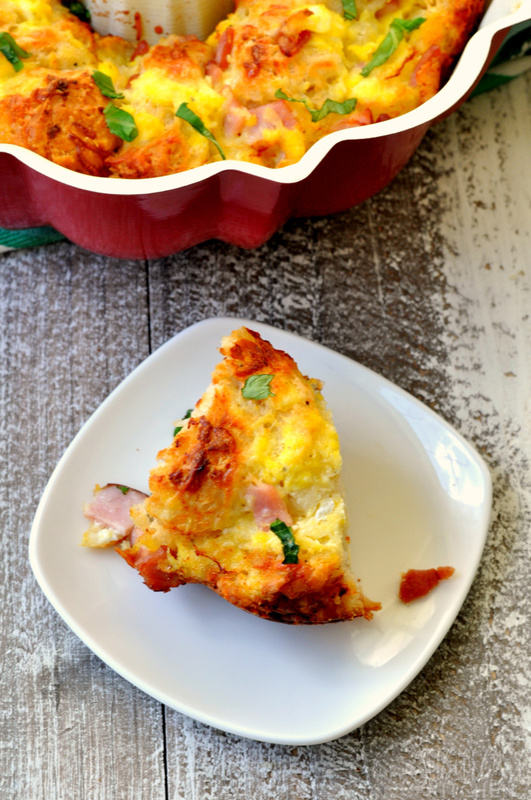 So, I can totally attest to this being an awesome make ahead breakfast recipe that you can bake and enjoy throughout the week. Just wrap it in a damp paper towel to reheat. This recipe is so versatile so definitely play around with the ingredients to find out what your favorite combination is. This monkey bread recipe is a great way to feed a crowd for brunch without having to make bacon and eggs for everyone! You pop this in the oven and enjoy everyone’s company while it bakes. 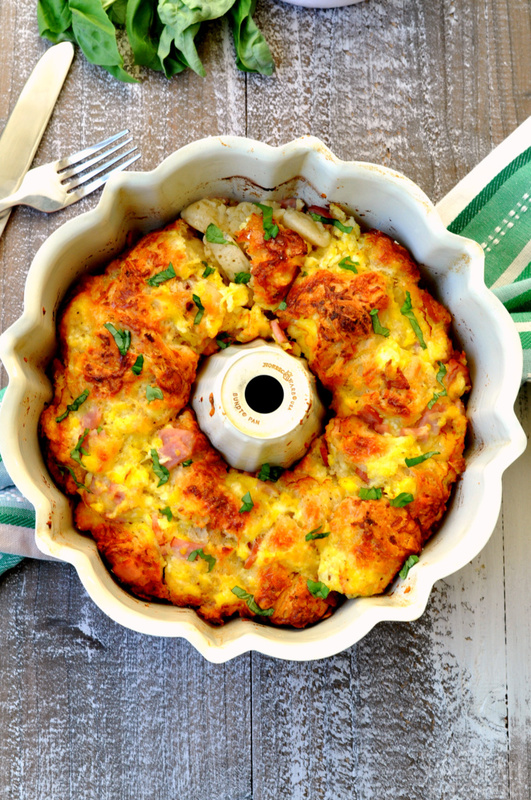 This savory monkey bread makes the perfect breakfast option. Make it ahead and enjoy it all week or serve it at your next brunch as an easy way to feed a crowd. Preheat oven to 350 degrees. Lightly spray a bundt pan with nonstick cooking spray. Cut each biscuit into 6 pieces. Toss with melted butter in a large bowl. Add eggs, Canadian bacon, bacon and cheese. Toss to fully combine. Add to prepared bundt pan. Bake in preheated oven for 30-40 minutes or until lightly browned on top and fully set. This is such a wonderful breakfast idea! My family will love it! This is so smart, saving this for the holidays!